⦁ Remove 2 chiles from can; finely chop, reserving remaining chiles and sauce for another use. ⦁ Heat a large Dutch oven coated with cooking spray over medium-high heat. Add chiles, 1 3/4 cups onion, bell peppers, garlic, and Piemonte Chorizo Mexicano chorizo; sauté 5 minutes or until tender. Add chili powder and next 7 ingredients (chili powder through corn), stirring to combine. Bring to a boil. Reduce heat, and simmer, covered, 30 minutes, stirring occasionally. Remove from heat; stir in salt, and black pepper. ⦁ Ladle 1 cup chili into each of 12 bowls. 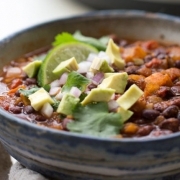 Top each serving with 1 tablespoon sour cream, avocado, cilantro, cheese, lime and 1 tablespoon onion. Serve with tortilla chips. Heat 1 tbsp olive oil in medium skillet and cook the onion and bell pepper until soft stirring often – about 7 minutes. Mix the meats together – use fork or hands. Combine eggs, salsa, chili powder and salt. Add to the meat and mix. Add the oatmeal and continue mixing. Make two oval loaves and place in a shallow pan with sides. I put a light coating of catsup on top. Bake at 375 for about 1 hour and 10 minutes. Camping ‘Up North’? A Hearty Hot Meal! Camping ‘Up North’? Need a hearty hot meal at the end of a long hike or paddle? Try Piemonte Sausage Bernie’s Sweet (Mild) or Bernie’s Fennel and Hot in Sausage Stew or Chorizo Mexicano in your chili for an extra zesty meal. 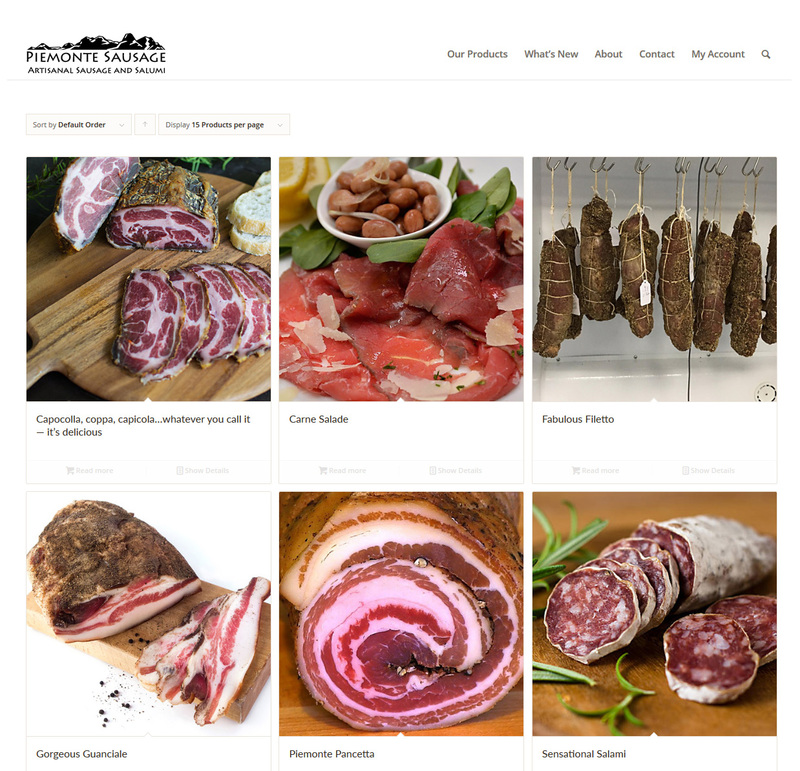 http://pssge.accu4.com/wp-content/uploads/2018/04/piemonte-sausage-logo-300x110.png 0 0 Nani Baker http://pssge.accu4.com/wp-content/uploads/2018/04/piemonte-sausage-logo-300x110.png Nani Baker2018-08-29 12:52:262018-08-26 12:57:46Camping ‘Up North’? A Hearty Hot Meal! Time for grilling, picnics and days at the pool. 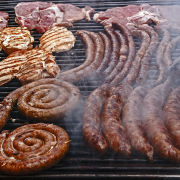 A perfect time to grill or roast Luganeca Piacenza or Luganeca Monza Piemonte Sausage. Made in a small coil, you can grill the two Luganeca style sausages all at once and cut up for appetizers or a finger food snack. Check our favorite recipes page here. https://www.piemontesausage.com/wp-content/uploads/2015/06/SausageOnGrill.png 801 1200 Nani Baker http://pssge.accu4.com/wp-content/uploads/2018/04/piemonte-sausage-logo-300x110.png Nani Baker2018-07-29 15:02:492018-07-23 16:05:00Summertime fun! ⦁ Put the potato halves in a saucepan with 1/2 t salt and cover with water. Bring to a boil, reduce heat and simmer for about 15 minutes until the potatoes are done, but firm and easily pierce with a fork. Drain and let cool. Dice into 1/3″ cubes. Set aside. ⦁ In a skillet, heat 1 T olive oil and saute onions with 1/2 t salt, cumin and oregano, about 6 minutes. Add crumbled chorizo and cook stirring until chorizo is done, about 6-8 minutes. Add diced potatoes and cook until the edges of the potatoes begin to crisp, another 5 – 6 minutes or so. Remove from heat and set aside. ⦁ Ladle about 1/3 cup of enchilada sauce into the bottom of a 13 x 9 x 2″ rectangular or a 12″ round baking dish and spread it around to coat the bottom of the dish. ⦁ Now you begin the assembly of the enchiladas. Take one tortilla dip it in the red sauce to coat both sides. Remove the tortilla from the sauce and place it on the plate you will use to assemble the enchiladas. Put about 1/3 cup of the chorizo and potato filling down the center of the tortilla. Top with about 1 T of the shredded cheese. Roll up like a cigar and lay seam-side down in the baking dish. Continue until all the enchiladas are assembled and nestled side-by-side in the baking dish. ⦁ Pour about 1 cup of the remaining sauce over the enchiladas. Sprinkle the center of the enchiladas with the remaining cheese and bake for 20 to 30 minutes until heated through and cheese has melted. ⦁ Garnish with chopped tomatoes, cilantro leaves, green onions, sour cream and/or guacamole. 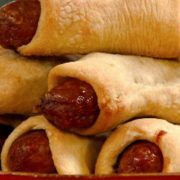 Here is an easy and tasty appetizer to make for your next party, game night or pot-luck. 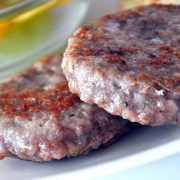 Spice it up with all natural sausage from us. In a saucepan add 1/2-inch water to the pan. Immerse sausages in water and simmer for 10 minutes. Remove sausage and dry the pan. Return to the heat and add the olive oil on medium heat. When hot return the sausage to the pan with garlic cloves and saute until medium brown all over. Remove garlic to a bowl. Remove sausage to a plate to cool. Use a fork to mash the garlic with salt and pepper. Stir in mustard and set aside. Cut each piece of dough into 2 and roll out until 1/4-inch thick. Cut 6 pieces of dough about 3 inches wide and 1/2-inch shorter then the length of sausage, just enough to wrap around sausage with the ends peeking out. Spread bottom of each dough with a tablespoon of garlic/mustard paste. 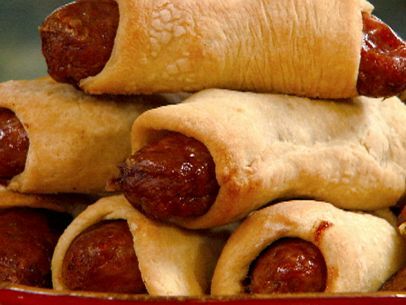 Set sausage on top, moisten 1 dough edge with a wet finger so it sticks together and roll. Press the seam firmly and set them on a lightly floured sheet pan, seam side down. Brush with olive oil. Bake until brown all around. Remove and let cool for 5 minutes. Cut into 3/4-inch long pieces and serve. Place the lentils in a large saucepan. Add 2 quarts of water and bring to a boil. Pierce the skin of the sausage all over with the tip of a sharp knife. Place the sausage in the saucepan with the lentils. 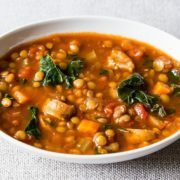 Reduce heat to a simmer, cover, and cook 45 minutes, or until the lentils are tender. Remove the sausage and set it aside to cool. Drain the lentils and set aside. When the sausage is cool enough to handle, slit open the skin and remove. Cut the sausage into thin slices. 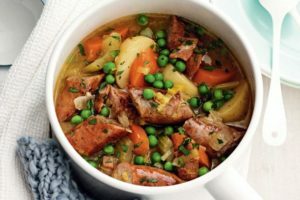 Cook the sausage slices in a skillet until golden brown on both sides, about 2 minutes. Remove the sausage and set aside. Add the olive oil to the skillet and heat over medium-high heat. Sauté the pancetta, onion, carrots, and celery in the olive oil until soft, about 6 to 8 minutes. Add the tomato sauce, lentils, and bay leaf. Cook over low heat, covered, for 5 minutes. Season with salt and pepper. Remove the bay leaf. Pour the lentils onto a serving platter and arrange the sausages around them. Serve. Enjoy! Any flavorful Italian sausage may be substituted. ¾ cup finely chopped onion. 1 lb. Piemonte Apple/Cranberry/Pecan Sausage with casings removed. Remove casing from sausage crumble and brown. Set aside. Cook and stir onion and celery in margarine or butter and sausage drippings until the onion is tender. Stuff turkey just before roasting or put into a dish and bake at 325 degrees for 35 – 40 minutes. 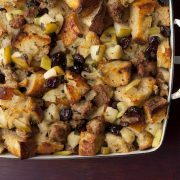 About 9 cups of stuffing (12 lb. turkey). 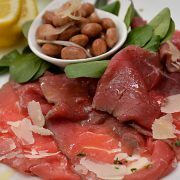 Follow us on social media for a more casual Piemonte experience!